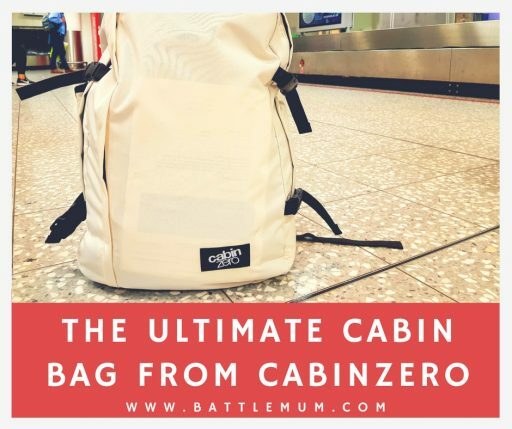 CabinZero bags first came to my attention earlier in the year but for some reason their name escaped me when I started trying to find the ultimate cabin bag. As a mum of a pre-schooler I have travelled with a baby change bag for a few years. This always had everything I needed for him but we had to travel with at least a second bag for anything my husband and I needed for flights. Even worse, I had to travel lightly myself if I was flying solo with our son. However, after our son was toilet trained I no longer had the need for a cumbersome change bag. And so, my search for the ultimate cabin bag commenced. We considered normal backpacks but nothing quite suited our needs. Large weekend bags were just awkward to use with an energetic pre-schooler in tow. 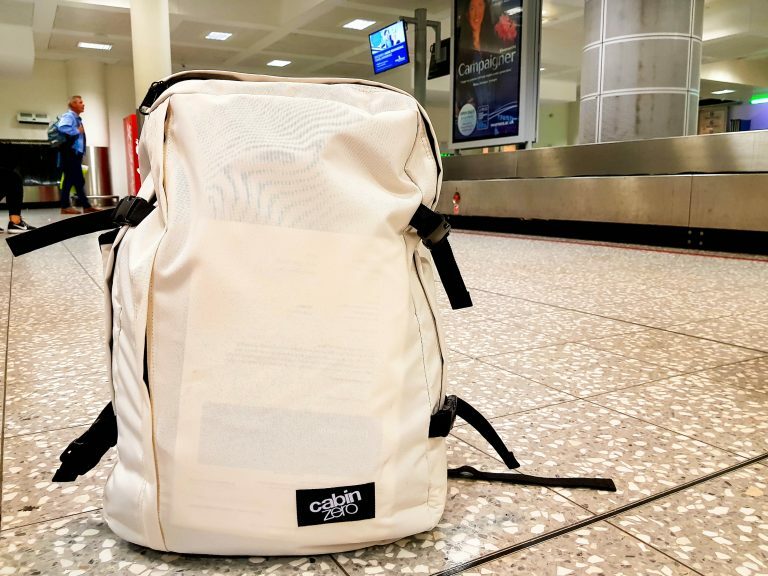 What I believe is the ultimate cabin bag from CabinZero has been designed by a British company and is the brainchild of Neil Varden, the founder of CabinZero. In his own eternal quest to find a lightweight, lockable, trackable, durable travel and cabin bag, he designed his own and CabinZero was born. Hailed as an urban carry-on, these lightweight cabin and travel bags are not only practical but very stylish. All the CabinZero range are cabin sized and fits 55 x 40 x 20cm. They can be carried in a variety of ways including by hand or as a backpack. This alone was a huge advantage for me. 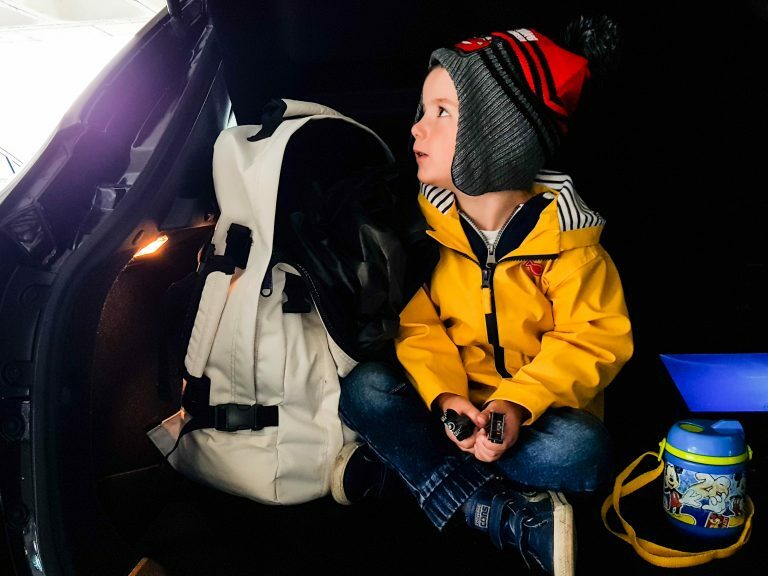 Having both options when travelling with a pre-schooler is a must. CabinZero bags come in a range of capacity from 28L to 44L, they have global tracking built in with Okaban, have lockable YKK zips, are made from lightweight, yet durable materials and come with a minimum 10 years warranty. And there are loads of colours to choose from. All of this, in my eyes, makes them the ultimate cabin bag. 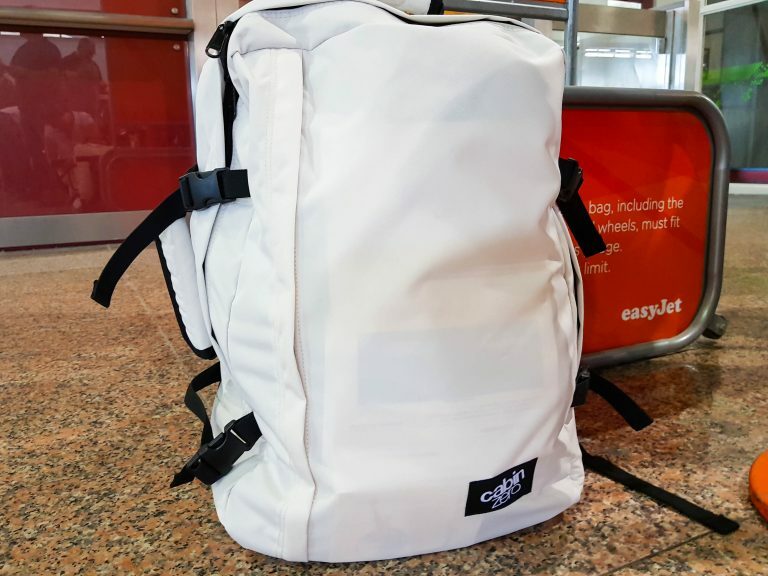 I received the Classic 44L Cabin Zero bag in white for review and was absolutely thrilled to receive it prior to our recent visit to Bluestone in Wales. And believe me, choosing one colour is not as easy as it sounds as the range available is large. We have visited Bluestone many times before, but this time we were going as part of their Bloggers Programme and we were also flying into the UK from Portugal. So, this gave me the perfect opportunity to road test our CabinZero bag. When I received my bag from CabinZero I knew instantly what it was that first piqued my interest in them. It’s how stylish they are! They don’t resemble your typical hiking backpacks and yet still maintain a look of versatility, durability and most importantly, style. On closer inspection it’s a great bag made of high-quality materials. The outer shell is a waterproof polyester, with the inner being made from polyester. The zips are YKK zips and are strong and have loops to allow them to be locked for safety and security. The seams and stitching are well constructed too. The main compartment is large, mine with a 44L capacity. There is an internal zipped compartment and a netted one too. In the front is a side-zipped compartment which is large enough to store my 15” laptop with room to spare. The sides are secured with strong side release luggage straps too. The bag has two carry handles, one on top and one on the side and has strong, padded shoulder straps to convert it from a carry bag to a backpack. The back is also padded. 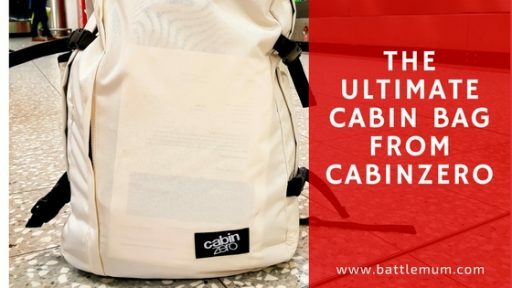 Do I really think this is the ultimate cabin bag from CabinZero? A bag of spare clothes for BattleKid. A bag of spare t-shirts for BattleDad and I. A set of Bose QC15 headphones for BattleKid (not small in their case!). Toiletries bag containing essential just-in-case items for the plane. My blogging notebooks and pens. Wallets, sunglasses and light jackets for all three of us. Portable chargers and cables for our phones and tablets. All our travel documents and papers. Snack boxes for BattleKid and his drinks bottle. Additional bottles of water bought at the airport. On the way back from the UK I fitted even more into the bag. And again, had room to spare. The 44L CabinZero Classic bag really is big. And while we were visiting Bluestone, it doubled up as a day-out bag. I hadn’t brought a spare bag with me, so for our trips out to discover some of Pembrokeshire, it worked well to carry spare clothes and snacks for BattleKid. Within Bluestone, it came into its own when we visited the Blue Lagoon, their swimming pool. I managed to fit all our swimming gear, towels and toiletries inside. And it fit neatly into the changing lockers too. It was truly an all-round perfect bag for our trip to Bluestone from Portugal. Ultra-lightweight, weighs only 760g so doesn’t impact your weight allowance like some bags. Airline approved (50 x 40 x 20cm) so will fit even the meanest of airlines’ carry-on limits. Made from strong, durable materials and has a waterproof outer lining. Made with YKK zips which are lockable for safety and security. Thick padded shoulder straps to use as a backpack. Has two carry handles on top and at the side. Comes in a range of capacities from 28 to 44L and a large range of colours are available. Fitted everything we needed into it, with lots of room to spare. Doubled-up as a day-out bag while out and about in Bluestone and wider afield in Pembrokeshire. Very comfortable to wear and easy to fit into overhead lockers on the plane. 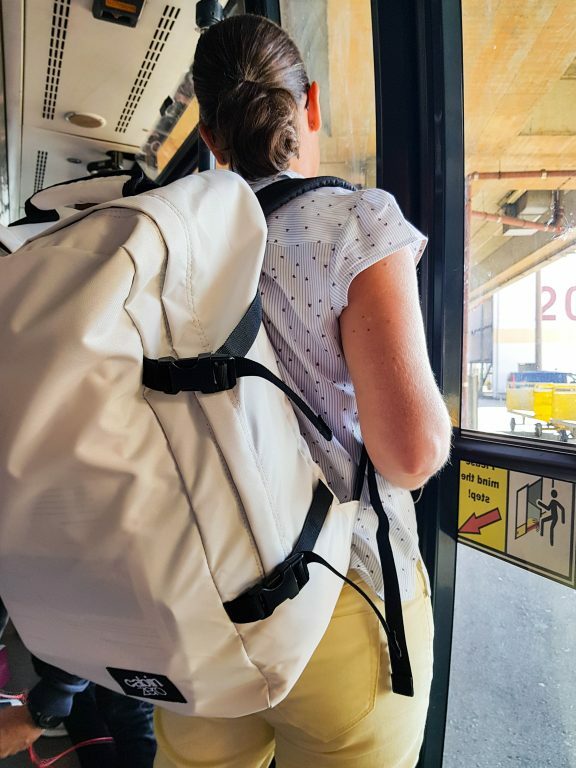 Having a backpack type bag is always handy when travelling with a pre-schooler as it leaves both hands free to keep hold of them in busy airports. Our overall verdict is this bag is absolutely brilliant, as not only a cabin bag, but as a day-out bag too. For families it is by far an extremely versatile bag, that is not only stylish but comfortable to wear, and with lots of room for both kids and adults’ essentials. 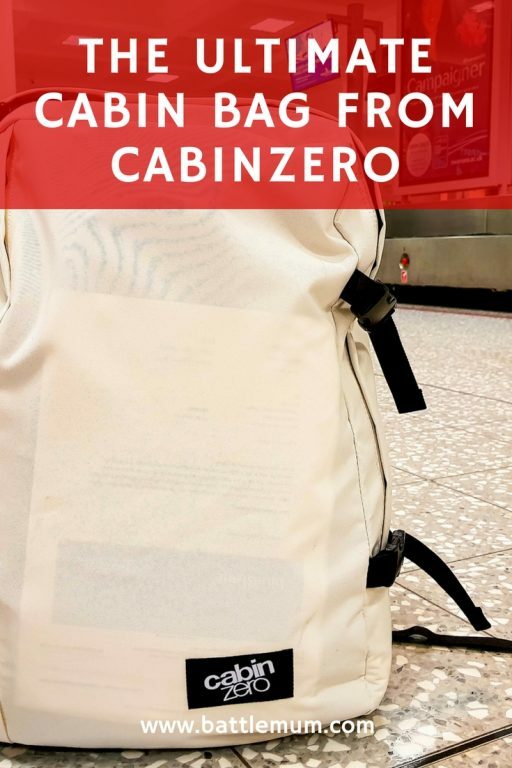 I cannot express how thrilled I am to have had the opportunity to receive a CabinZero bag for review, and have already gotten rid of one of my other backpacks that I’d been using as a travel bag. This fits everything we, as a family, need for a comfortable plane journey (and more), and will get a lot more use from here on in, starting with an overnight stay in Northern Portugal tonight and also our forthcoming trip to Disneyland Paris in December. 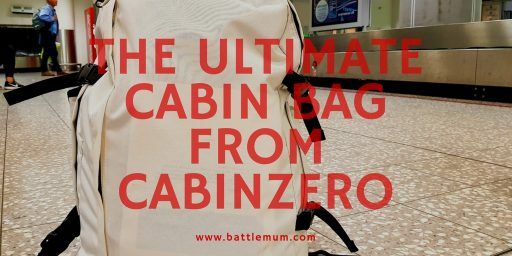 So, if you are sick of struggling with cabin bags and are on the hunt for one that ticks all the boxes, I highly recommend you check out what I believe is the ultimate cabin bag from CabinZero. There are bound to be a few that will fit all your needs. Not only will you have a cool and stylish cabin bag, but also something that easily and comfortably doubles up for days out, wherever your wanderlust takes you. BattleDad has already hijacked it for a business trip back to London this week! 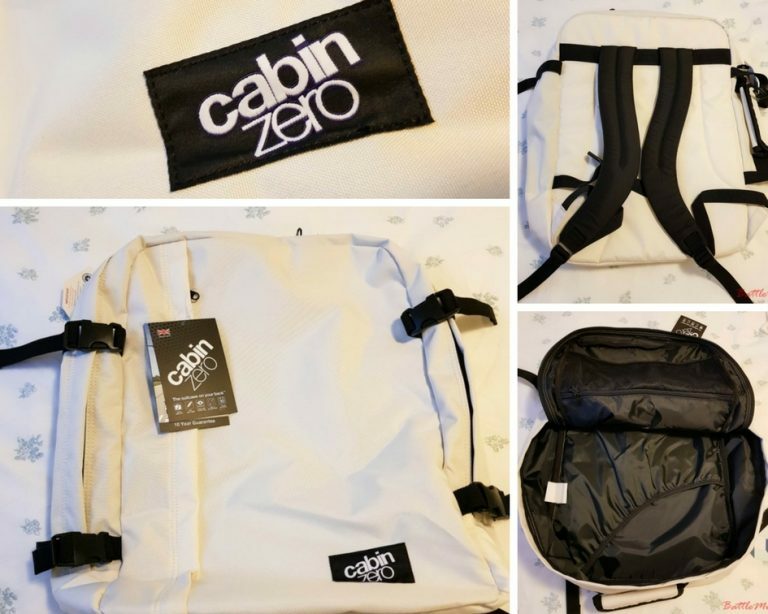 If you’d like to get your hands on a great cabin bag from CabinZero, check out the full range on their website. *I received the Classic 44L white CabinZero bag for the purpose of this review. However, as always, these are my own honest thought and opinions of the bag. **To remain fully transparent, please be aware that this post contains affiliate links. That means that I receive a small commission if you make a purchase after clicking the link – this doesn’t cost you anything extra and helps support my blog. Thank you. I love that it has so much space but that it’s soft and you can wear it on your back. God knows you need your hands when travelling with kids! Off to check out their range of colours! Couldn’t agree more about needing your hands. This bag ensures they’re free to tackle toddlers haha! What a stylish bag, I just clicked through to the website and love the colours it comes in – I’ve been looking for a bag for my brother as he always borrows one of ours and these look perfect. I also love that you listed exactly what you got in it in your review – really helpful to visual! Thanks Sarah, I appreciate your comment. We’ve just used it as an overnight bag and it’s so versatile. Wow. These bags would be so handy for our hospital stays. We don’t get to go away much but we do spend alot of time packing loads of bags for hospital stays. This really would be ideal . They don’t look too chunky either which is always a plus when you’ve a wheelchair and meds to carry too. I’d totally use one of these ! Sounds like you’ve just found another great use for these CabinZero bags! We’ve literally just used it this weekend as a weekend away bag and it was brilliant. Such a versatile bag. 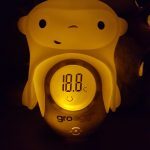 I cannot recommend it enough, especially for travelling with kids. Kerry, it’s been brilliant. We’ve just used it as an overnight bag too and it has tonnes of space. This bag looks great. Like that you can wear it on the back. Carry on luggage usually gives me head ache. Couldn’t agree more Stella. This is a great cabin bag! I love the colour! And you can put so much into it. It is crazy as it looks so light but it is very resistant! It is really light but very strong. A great bag and a suitable alternative to a carry on suite-case. I hope they have different colours, cos that white one would be hard to keep clean. They have a whole range of colours to choose from and a few different styles. So there’s something for everyone with CabinZero. oooh, this would make a fab changing bag. I’m the type of person who likes to take everything plus the kitchen sink with me. It will definitely fit the kitchen sink in it haha! For travelling with kids, this is a great all-rounder. A great cabin bag with loads of space and then can be used out and about at your destination. This looks Great! Anything that makes life a little bit easier gets the thumbs up from me! Thanks for the review! I love that it is trackable as well as lockable – two features you just wouldn’t get in a backpack. The fact that it’s lightweight is great too – sometimes bags are so heavy before you even put anything in them! It’s a great all-round bag! It really is a great bag. Big inside and fits all low cost airline dimensions! This looks great for family city tripping! Handy to have somethng that is big enough to fit a lot in but small enough to fit in the overhead cabin! It’s such a great all-round family cabin bag! They’re amazing bags for families who travel!